No Eggs Benedict would be complete without this delicious, creamy hollandaise! Also a great accompaniment to asparagus and fish. Can be served warm or cold. Add a touch of gourmet to your dish with this classic french condiment, hollandaise sauce. 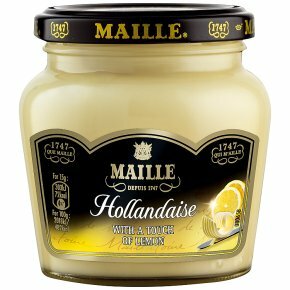 A classic french condiment, hollandaise sauce is at the heart of french cuisine, Maille takes the trouble away with this delicious hollandaise, with a touch of lemon. Serve with steamed asparagus for an instant classic or with poached eggs, ham and muffins for a classic eggs benedict. With 270 years of experience, Maille is the expert when it comes to the perfect balance of flavours and gourmet quality, this hollandaise sauce is no exception. Why not try Maille's range of french mustards? The classic dijon original, the crisp wholegrain or the tart and sweet dijon with honey. This hollandaise sauce is a lovely sauce in Maille's unique collection of french condiments. Add a touch of gourmet to your dish with this classic french condiment, Maille hollandaise sauce. A classic french condiment, Maille hollandaise sauce is at the heart of french cuisine. Maille takes the trouble away with this delicious and rich hollandaise, with a touch of lemon. Serve with steamed asparagus for an instant classic or with poached eggs, ham and muffins for a classic eggs benedict. With 270 years of experience, maille is the expert when it comes to the perfect balance of flavours and gourmet quality. This Maille hollandaise sauce is no exception. For an added gourmet touch of flavour with any dish, try Maille?s range of french mustards. Delicious added to a variety of dishes, and particularly perfect with steak, or as an addition to a vinaigrette. Try Maille?s classic dijon original, with a blend dating back to 1747, when Maille was founded, the delectable mustard will subtly enhance the flavour of any dish. For a crisp texture and a bold flavour hit, taste Maille?s wholegrain, with beautiful full mustard seeds. Or for a modern twist on a classic, try Maille dijon with honey, the perfect blend of tart warmth from the dijon with the smooth sweetness of honey.